Situated just above the beach in Bol, Apartments Račić presents air-cooled interiors fitted with free internet access and boasting direct sea views. The apartments have satellite television and either an outdoors terrace or balcony. Free car parking is provided on site. There is a dining establishment right next door, a grocery shop is 30 metres away, and a pizza place is within 40 metres from the Račić. The property is centrally located in the tiny city of Bol. The catamaran terminal is 200 metres away and provides connections to Split. You can also visit an old Dominican abbey 300 metres from the apartments. The widely known Zlatni Rat Beach is 1.5 kilometers away. Dragon's Cave in the settlement of Murvica is at a distance of 5 km. Skrip ( ~ 11.3 km ): 2+ hotels. Beach Samostan, Bol ~ 0,6 km from Apartments Račić Sandy beach: ideal for families, recommended for young people, awarded with blue flag, with restaurant, with caffe bar, equipped with showers. Beach Zlatni Rat, Bol ~ 2,3 km from Apartments Račić Sandy beach: ideal for families, recommended for young people, with restaurant, with caffe bar, equipped with showers. Excellent choice of watersports. 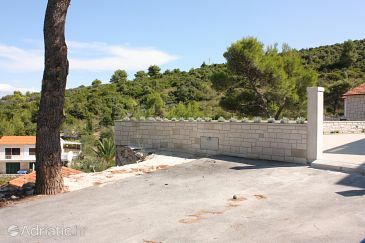 Beach Fkk Paklina, Bol ~ 2,4 km from Apartments Račić Sandy beach: ideal for families. Nudism is allowed. Beach Basina ~ 7,1 km from Apartments Račić Concrete beach: ideal for families, with restaurant, with caffe bar, equipped with showers. Excellent choice of watersports. Beach Fkk Zecevo, Vrboska ~ 8,3 km from Apartments Račić Gravel beach: with restaurant. Nudism is allowed. Restaurant Restoran Centar Marijan, Bol Guest reviews: 8,5/10 ~ 1,9 km from Apartments Račić Address: Put Zlatnog Rata Bb, Bol. Cuisine: International cuisine. Restaurant Vagabundo & Bar, Bol Guest reviews: 7,2/10 ~ 0,6 km from Apartments Račić Address: Ante Radica 36, Bol. Cuisine: Croatian cuisine. Restaurant Arguola sandwich bar, Bol Guest reviews: 9/10 ~ 0,5 km from Apartments Račić Address: Ulica Vladimira Nazora 6, Bol. Cuisine: Fast Food. Restaurant Equinox, Bol, Bol Guest reviews: 7,7/10 ~ 0,5 km from Apartments Račić Address: Vladimira Nazora 6, Bol. Cuisine: Croatian cuisine. Restaurant Ribarska kucica, Bol ~ 0,2 km from Apartments Račić Address: Ante Starceviceva bb, Bol. Prices: 218 HRK - 868 HRK. Cuisine: Croatian cuisine.